New from Williams-Sonoma: Snow White licensed baking items. 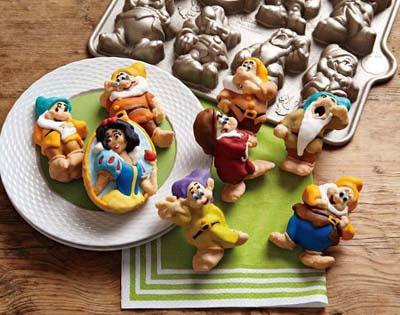 There's actually only two dwarves shown in this Snow White and the Seven Dwarfs cookie cutter set. 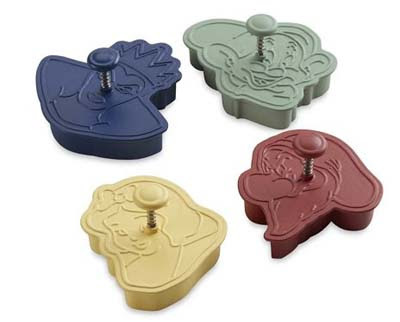 But then again I'd probably just use the Wicked Queen cutter over and over again to make dozens of batches of evil cookies for Halloween. Keep in mind that a professional food stylist and cake decorator frosted these Snow White and the Seven Dwarfs cakes. I imagine mine would look not anywhere near as pretty. Still, I'm looking forward to trying my hand. These would be perfect at your next fairy tale tea party! 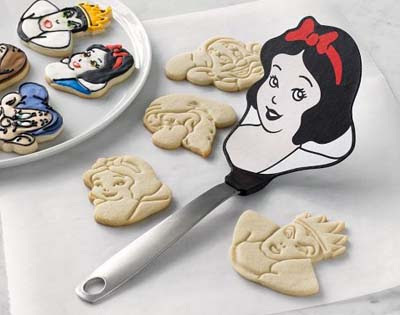 Lift your Snow White cookies using this Disney approved Snow White spatula. It will look pretty sitting around in a jar in your kitchen, too.